CREATIVE CARTOGRAPHY and WORDPLAY, derived from post #17. PARODY COMPOSED: Giorgio Coniglio, March 2016, revised February, 2017. 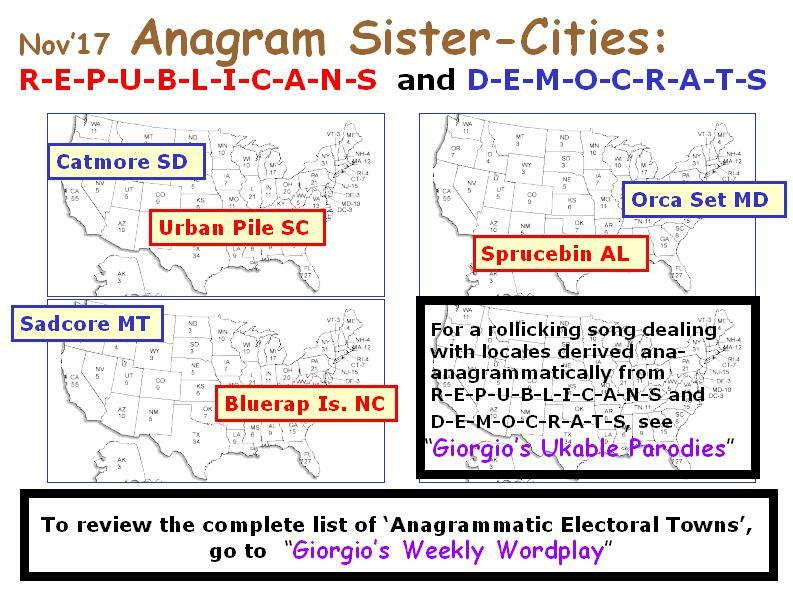 SONGLINK: On "Giorgio's Ukable Parodies", post #122, a parody-song "Great Anagrams" deals with the distribution of anagrams based on the words R-E-P-U-B-L-I-C-A-N-S and D-E-M-O-C-R-A-T-S.
EXPLANATORY NOTE: The initial concept for this piece, developed during the buildup to the election of November 2016, highlighted the nonsense of anagrams as a mechanism to defuse the intense partisan animosity that became manifest during that tumultuous period. Unfortunately, following the election, the animosity has continued and even intensified further. Different media sources, viewpoints and responses to developments characterize the 2 populations, which now live in 'alternate realities', and it has become more difficult to 'sit on the fence' (a frequent pose taken by the author). Consequently, I now propose a mechanism for reintegrating our divided society, and returning to a more balanced equilibrium. Communities might be easily located where the predominant viewpoint reflects one of the '2 solitudes'. Even within these towns, more open-minded citizens could be persuaded to become involved in exchanges with 'sister-cities' that otherwise share some demographic similarities, but who presently seemed to be uncompromisingly devoted to the opposite point-of-view. Here are some initial proposals for pairs of communities which might benefit by such an exchange of viewpoints.